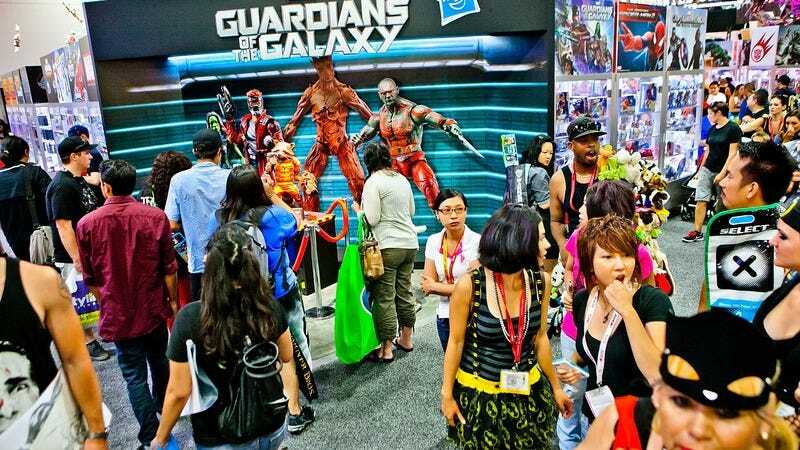 In news that may actually come as a welcome relief for people who want to go to a comic-con and actually buy some comics without being banished to the furthest, coldest, stinkiest reaches of the convention hall, Variety reports that key nerdbait producers Marvel Studios and Sony (and Paramount Pictures) have all decided to skip the San Diego Comic-Con this year. The decision was based not on the companies’ inability to listen to one more complaint about Spider-Man casting (there’s really no winning on that one), nor was it an embarrassing cosplay malfunction that led them to decide that they just can’t show their corporate faces at the SDCC this year. Apparently, it’s simply a business decision: Marvel Studios has been hinting for months that it might not make it this year, as it’s already quite confident that you will do anything it tells you to do, even if you lose your mind in the process, and Sony and Paramount say they simply don’t have any upcoming fanboy fare to promote, as impossible as that may sound. Another potential reason is that, as powerful as these companies may be, they still don’t have their own goddamn religion like Star Wars, which will be the centerpiece of Disney’s Comic-Con presentation this year. (The newest Pirates Of The Caribbean sequel and Finding Nemo 2 will also be unveiled.) DC could also attract some attention at the con with Suicide Squad, which is currently filming and may be hoping to rebuild the goodwill lost with the reveal of Jared Leto’s mall-Goth Joker a few months back. If the rest of Suicide Squad is as poorly received as that was, staying at least a thousand feet outside the angry-nerd blast radius might be a good idea anyway, especially now that you can’t vape the rage away on the convention floor.